Nevada National Guard 92nd Civil Support Team Soldiers and Airmen spoke about their unit’s mission and capabilities with dozens of attendees at the Two-Year College Chemistry Consortium held at Truckee Meadows Community College. Emerson Marcus/Nevada National Guard Nevada Air Guard Maj. Jami Cavins, a nuclear-medical science officer with the Nevada Guard's 92nd Civil Support Team, speaks at the Two-Year College Chemistry Consortium at Truckee Meadows Community College this spring. The group, headquartered in Carson City, is the first military responder at apparent chemical, biological, radiological, and nuclear incidents. The team supports local incident commanders and emergency responders as well as state and federal agencies including the FBI, the Environmental Protection Agency, the U.S. Secret Service and the Department of Homeland Security. 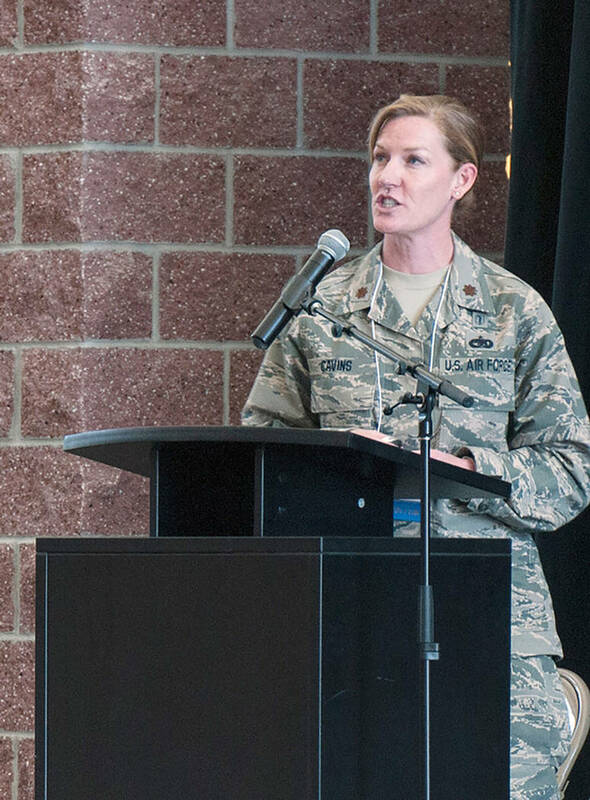 Nevada Air Guard Maj. Jami Cavins, a CST nuclear-medical science officer, addressed more than 50 chemists, academics and teachers in attendance at the campus’ Red Mountain Building in Reno. One of the biggest reactions from those in attendance came when Cavins described the scene of an incident the group recently reported to in rural eastern Nevada. When the team members arrived, they tested every bit of evidence in sight, including one pound of red phosphorus and 15 pounds of mercury and methamphetamine. “This house had a little bit of everything. We even tested one substance that turned out to be very, very old peanut butter. That was strange,” Cavins said as the audience laughed. Tech. Sgt. Emerson Marcus is state historian for the Nevada National Guard.